I wanted to do a short note on some of the additional Saga factions I intend to do next. I have been diverted doing some other stuff and the good weather has been non-inspiring with regards to painting. Senator shuttle, debris fields, satellites for X-wing from Combatzone Scenery and some laser turrets I bought off ebay ages ago. Immersion and diversion level increasing. For these I would just use the Baccus Viking codes (Spearmen) for hearthguard and some later roman lanciarii for Levy Javelins (although by now I have painted more of the buggers than I would have liked to). This gets slightly more interesting and I thing the codes above gives a nice mixture of different troop types. Starting Army: Mounted Warlord (CFR04 – Turcopoles), 2 No. Mounted Hearthguard (CFR04 – Turcopoles), Warrior (EMV02 – Unarmoured Spearmen) and Warrior with Bow (ALR05 – Archer). I have had a few busy days since returning from the Joy of 6 show and I suppose I need to write a summary of what happened on the day. In short it was an excellent day. We actually arrived the evening before and had the pleasure of doing the traditional stop in Broom Hill for an ale at the York and then a Curry at the Balti King with Peter Berry et al. It is a nice little preamble to the show and this year the discussions ranged from milk protein paint (looks interesting indeed) to kickstarters we had backed (seems like I am not the only one who has some big boxes of stuff at home). The Sunday weather on offer was magnificent and I do not miss the old venue as it tended to get very hot inside. The new venue is superb and it is nice to see how the show grows every year and the selection of periods, game systems and style of presentation is very varied and makes the event well worth going to. It is also nice to meet up with some old friends, although the time for a chat is limited when you are running a participation game. Here are a few links showing off some of the stuff presented on the day (one, two, three, four). Our two tables on the day. Note the Lewis chess set Queen overseeing the proceedings on the table. According to the British museum they are from the period 1150-1200 which is a little bit later than the 10th to 11th century of the Saga game – no one seemed to mind though. I and Neil Shuck arrived at about 9am with the doors opening at 10am. 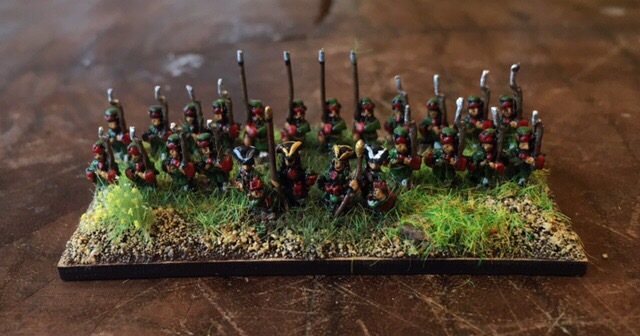 Usually I have hundreds of Great Northern War units to put up which invariably I mess up giving me an headache in setting up – does the Kalmar regiment stand on the left or right flank?, is the Dorrellian Dragoons dismounted or on their horses? Instead I just rolled out the mats and placed the terrain and we were good to go. Neil umpired the Kings table where we had Normans vs. Strathclyde Welsh and I umpired the Queens table where we had Vikings vs. Anglo-Danes. You can read about Neil’s day on his blog here. One of the first battles involved a lot of maneuvering in the forest areas. Note the canopies having been taken off leaving the darker tiles to represent the forest area. In later games I took away some of the forest areas to allow a more full on clash. Neil, not just a smooth voice on the radio but a pro umpire, just got straight into it and had a father and son playing within minutes so I just had to get going. We ran 7 or 8 games over the day and we did not dramatically change (at least knowingly) any of the original rules – they (the rules) works very well as a 6mm game. And it gives a different feel to the warband than in 28mm of being bigger – but not big enough to be an army. The Saga rule set allow the person with the most impressive facial hair to go first in case of a tie in rolling for initiative – and on more than one occasion it was hard to tell the best beard of the day! What is great with Saga is that it takes a while to master each faction and I learn something new every time I play (or in this case watch others playing it). Less forest and a more straightforward battle! I think everyone who tried out the game enjoyed it and although I do hope it promoted the Saga rulesets per se I am more keen that it provoked some thought about using alternative scales for other games. This is not universal but applies to a lot of games – Mike Whittaker has posted some interesting things about ground scale and other considerations you may need to take (see his blog.). I have seen Flames of war in 6mm and it looks beautiful especially when there are many tanks on the table compared to 15mm, Chain of Command is based on a 15mm ground scale but perfectly playable in 6mm using centimeters instead of inches (but some consideration should be given to the basing of team instead of individuals). Thanks to everyone who came by and asked about the terrain and how I had done this and that – it really makes my day! In addition a very big thank you to my daughter who helped out on the day and of course to Peter Berry and Wargames Emporium for putting on another fantastic show. I am also more than grateful for the support I have had from the Meeples and Miniatures crew in getting this done (Dave I hope your foot gets better soon and Mike we need to have a beer at some point) – so thank you Neil. I am not 100% sure what to do for next year but I have some thoughts…. Maybe a proper GNW action like the Battle of Lesnaya 1708? …or a Pegasus Bridge Chain of Command Scenario in 6mm? I will discuss a few more Saga issues in the next posts, including some thoughts on other factions and what Baccus models to use. Then we may move on to something completely different – but more about that later. Lazy update this time, a few actions shots from games I played with the little One (2 slide shows below). I hope they speak a little bit for themselves. The first one was between Normans and Anglo-Danish. I managed to win this one. The second one was between the Welsh and Vikings. I did not managed to use their abilities very well – so I lost. Not sure if you noted the fatigue markers. here they are.